Most marques have a golden era—that time when they dominated a race series, etching into memory iconic motorcycles and liveries. Honda has more than a few of those. 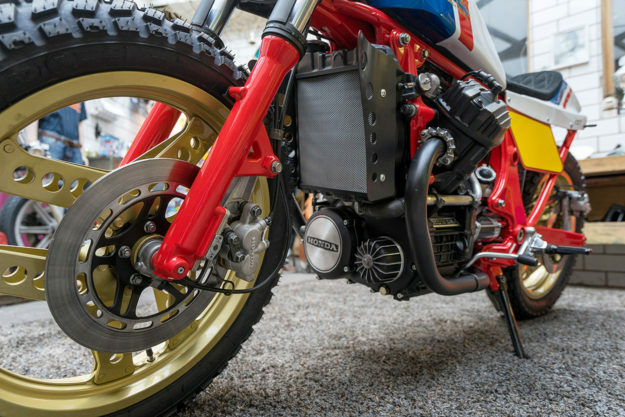 Take the legendary RS750: it hit the flat track circuit in 1983, and racked up multiple championships in the hands of Ricky Graham and Bubba Shobert. 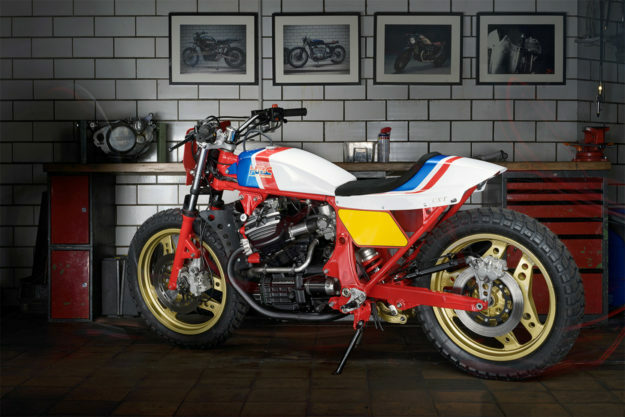 So when a customer gave his 1984 CX500E to Dirk Oehlerking of Kingston Custom, it was the RS750 that Dirk turned to for inspiration. 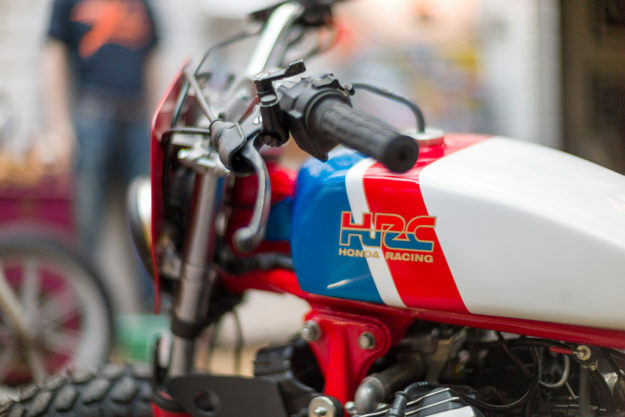 The brief to Dirk was short: “Build an unusual bike in an eighties style.” So he decided to emulate the tricolor mid-80s HRC factory look. Dirk’s customer had no intentions of racing his CX500 though—and no desire to bore it out or flip the motor. 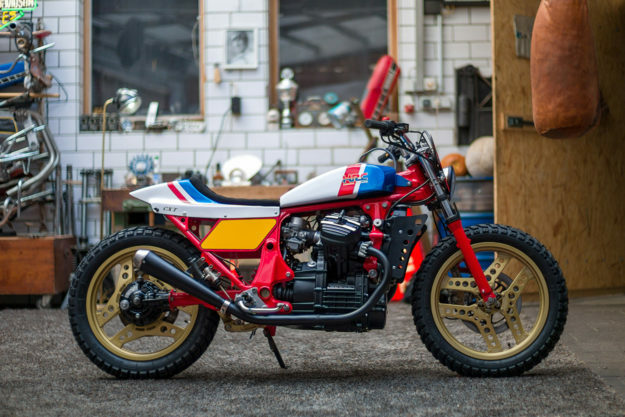 So this one’s more street tracker than full-blown race bike. To get the profile right, Dirk fabricated a compact, nine-liter aluminum fuel tank. 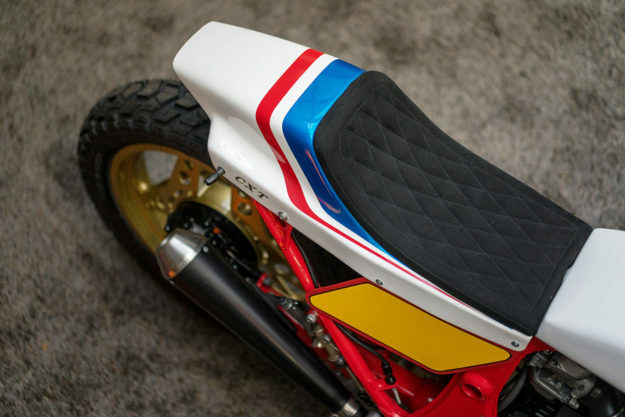 He then paired it with a Storz-style tail, complete with Alcantara on the seat pan. The subframe’s been trimmed a little to match too. 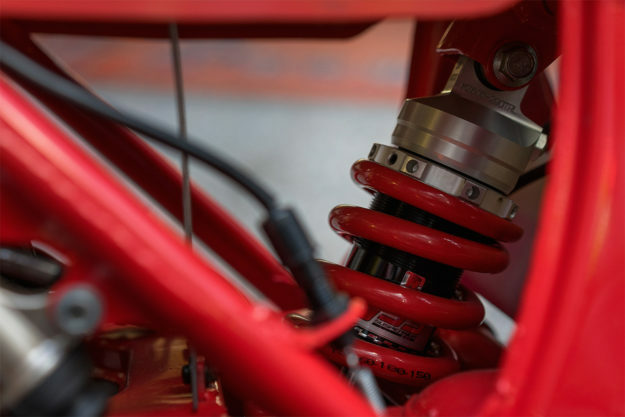 Moving lower down, Dirk then tweaked the Pro-Link monoshock setup to take a longer, custom-spec shock from YSS. Up front, he’s dropped the forks by four inches to balance out the stance. 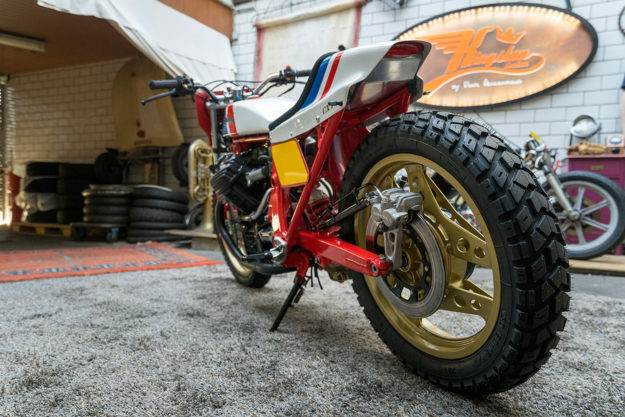 The wheels are the original Honda Comstars, finished in gold for ‘that eighties look.’ They’re wrapped in dual-sport rubber—Heidenau K60s—to give a balance between dirt-track attitude and asphalt grip. Dirk’s handiwork extends to the number boards, radiator grill, and two-into-one stainless steel exhaust system. He’s also tossed the airbox for a pair of K&N filters. There’s a Bates-style headlight upfront, and the taillight and turn signals are LED units. A small speedo, LSL handlebars and foot pegs, and stainless steel brake lines round out the package. Do we even need to talk about the color scheme? It’s perfect, right down to the authentic HRC logos on the tank. 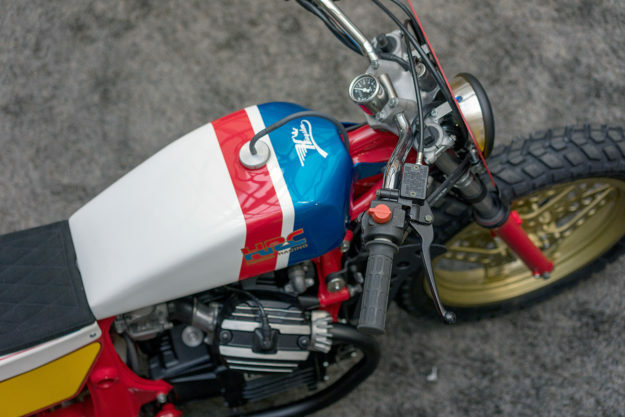 This CX500 might not be due for a life on the track, perpetually turning left—but you can be damn sure it’ll be turning heads.